Many of us, especially since 9/11, have become personally concerned about issues of security, and this is no surprise. Security is near the top of government and corporate agendas around the globe. Security-related stories appear on the front page everyday. How well though, do any of us truly understand what achieving real security involves? In Beyond Fear, Bruce Schneier invites us to take a critical look at not just the threats to our security, but the ways in which we're encouraged to think about security by law enforcement agencies, businesses of all shapes and sizes, and our national governments and militaries. Schneier believes we all can and should be better security consumers, and that the trade-offs we make in the name of security - in terms of cash outlays, taxes, inconvenience, and diminished freedoms - should be part of an ongoing negotiation in our personal, professional, and civic lives, and the subject of an open and informed national discussion. With a well-deserved reputation for original and sometimes iconoclastic thought, Schneier has a lot to say that is provocative, counter-intuitive, and just plain good sense. He explains in detail, for example, why we need to design security systems that don't just work well, but fail well, and why secrecy on the part of government often undermines security. He also believes, for instance, that national ID cards are an exceptionally bad idea: technically unsound, and even destructive of security. And, contrary to a lot of current nay-sayers, he thinks online shopping is fundamentally safe, and that many of the new airline security measure (though by no means all) are actually quite effective. 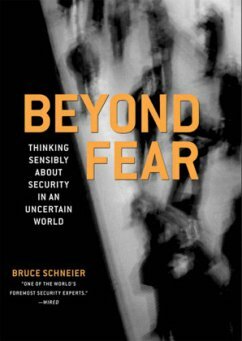 A skeptic of much that's promised by highly touted technologies like biometrics, Schneier is also a refreshingly positive, problem-solving force in the often self-dramatizing and fear-mongering world of security pundits. Schneier helps the reader to understand the issues at stake, and how to best come to one's own conclusions, including the vast infrastructure we already have in place, and the vaster systems--some useful, others useless or worse--that we're being asked to submit to and pay for. Bruce Schneier is the author of seven books, including Applied Cryptography (which Wired called "the one book the National Security Agency wanted never to be published") and Secrets and Lies (described in Fortune as "startlingly lively... [a] jewel box of little surprises you can actually use."). He is also Founder and Chief Technology Officer of Counterpane Internet Security, Inc., and publishes Crypto-Gram, one of the most widely read newsletters in the field of online security. Verlag: Springer, Berlin; Copernicus, N. Y.
Bruce Schneier is the author of seven books, including Applied Cryptography which Wired called "the one book the National Security Agency wanted never to be published" and Secrets and Lies, described in Fortune as a "startlingly lively jewel box of little surprises you can actually use." He is also founder and Chief Technology Officer of Counterpane Internet Security, Inc., and publishes Crypto-Gram, one of the most widely read newsletters in the field of online security. Sensible Security.- All Security Involves Trade-offs.- Security Trade-offs Are Subjective.- Security Trade-offs Depend on Power and Agenda.- How Security Works.- Systems and How They Fail.- Knowing the Attackers.- Attackers Never Change Their Tunes, Just Their Instruments.- Technology Creates Security Imbalances.- Security Is a Weakest-Link Problem.- Brittleness Makes for Bad Security.- Security Revolves Around People.- Detection Works Where Prevention Fails.- Detection Is Useless Without Response.- Identification, Authentication, and Authorization.- All Countermeasures Have Some Value, But No Countermeasure Is Perfect.- Fighting Terrorism.- The Game of Security.- Negotiating for Security.- Security Demystified.